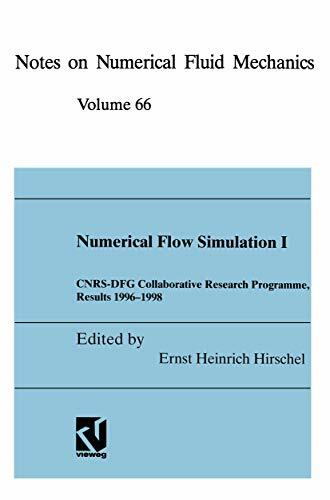 This volume contains twenty contributions of work, conducted since 1996 in the French­ German Research Programme ''Numerical Flow Simulation" of the Centre National de la Recherche Scientifique (CNRS) and the Deutsche Forschungsgemeinschaft (DFG). The main purpose of this publication is to give an overview over the work conducted in this programme, and to make the results obtained available to the pUblic. The reports are grouped under the four headings "Development of Solution Techniques", "Crystal Growth and Melts", "Flows of Reacting Gases" and "Turbulent Flows". AIl contributions to this publica­ tion were reviewed by a board consisting of T. Alziary de Roquefort (Poitiers, France), P. Bontoux (Marseille, France), JA Desideri (Sophia-Antipolis, France), W. Kordulla (G6t­ tingen, Germany), R. Peyret (Nice, France), R. Rannacher (Heidelberg, Germany), G. War­ necke (Magdeburg, ,Germany), and the editor. The responsibility for the contents of the reports nevertheless lies with the authors. E. H. Hirschel Editor Preface The Colloquium on ''Numerical Simulation of Flows", Marseille, November 21 and 22, th 1997, was the 6 Joint CNRS-DFG Colloquium organized in the frame of the French­ German Research Collaboration on Computational Fluid Dynamics. This Collaborative Program was elaborated progressively since 1991, when the two major research groups were brought together: the Priority Program "Flow Simulation with Super Computers" from the DFG in Germany and the Groupement de Recherche de "Mecanique des Fluides NumCrique" (GDR MFN) from the CNRS in France. Prof. Dr. Ernst Heinrich Hirschel arbeitet bei der DASA in München und lehrt außerdem an der Universität Stuttgart.